 In recent years there has been an increase in recognition – on the part of Federal and Provincial Governments in Canada – of the past injustices committed upon Métis, First Nations and Inuit People. Truth and Reconciliation forums are one part of the healing process; in collaboration with the airing of past injustices, a new government-to-government approach between Métis and other Aboriginal people and the Federal and Provincial Government of Canada have begun to shape a new era of respect and reciprocity. The historic Memorandum of Understanding (MOU) document recognizes the more than 60,000 self-identifying Métis in the province of British Columbia. The MOU acknowledges the uniquely distinct voice of the Métis community in BC. The recognition of the Métis voice as separate from that of other Aboriginal communities is the first step towards moving forward in the development of Métis culturally inclusive and specific child welfare strategies. Click the image to enlarge it. This document highlights some of the key agreements that are shaping our landscape as we move forward in a joint effort to acknowledge and address past injustices through collaborative teamwork. This is an action plan by the Ministry of Children and Family Development (MCFD) that supports the province-wide Integrated Framework for Children and Youth. The report outlines the five pillars that form the key elements of an effective child, youth and family development service system: Prevention, Early Intervention, Intervention and Support, the Aboriginal Approach, and Quality Assurance. This document is a framework structured on the provision of services by the Ministry of Children and Family Development (MCFD) to Aboriginal clients. It outlines a service approach structured in, and inclusive of Aboriginal traditions and customs. The document is meant to aid ministry workers providing child welfare services to Métis, First Nations and Inuit people in British Columbia. The MOU is a joint agreement between 5 provincial Métis service agencies and 3 provincial government organizations that was signed on February 27th, 2011.